Sketchy Sightings of a Resurrected Christ? Well, why aren’t they written? All four Gospels have gone to great lengths to record the wondrous things Jesus said and did before he was crucified. His followers now want us to believe that Jesus himself rose from the dead, that He appeared in bodily form, and that He continued to do signs and wonders. As that – the Resurrection – is obviously far more difficult for a non-believer to accept than reports of a man’s actions during his natural lifetime, one would think that the Apostles would particularly want to record those things He did post-Resurrection. While last week this column credited all the disciples for behaving in a way that made it very difficult not to believe they saw a resurrected Jesus, we must still acknowledge that while their devotional commitment was profound, their witnessing skills were remarkably sketchy. 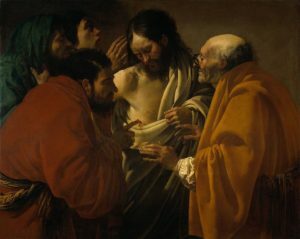 This phenomenon is, of course, why today’s famous story of “doubting Thomas,” which appears only in the Gospel of John, is so important. Jesus knows the human tendency is to doubt anything remarkable unless we have seen it or heard it ourselves. He knows that our own “confirmation bias” leads many people to discount even the word of numerous people if their testimony does not comport with what he strongly believes…. The whole column is here.